A Medieval maiden yearning for death? Classic Millais. Many details of the painting allude to time passing and her longing for death. The afternoon sunlight pouring onto her long-labored-over embroidery and her back-cracking stretch indicate the repetitiveness of her life. The leaves that litter her floor and work table evoke decay as she gazes disconsolately at the autumnal trees outside her window. 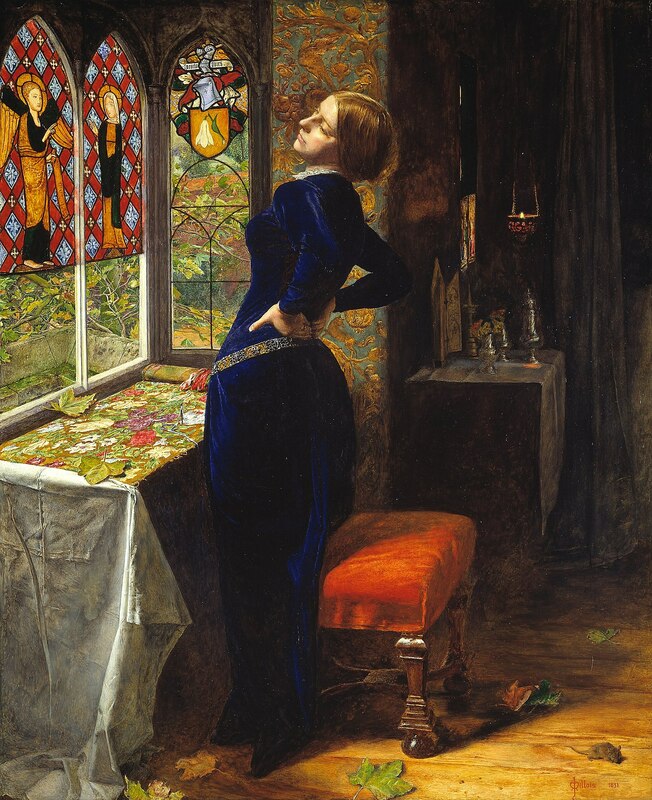 Even the stained glass, which was partly copied from Merton College Chapel and partly of Millais’ own invention, bears a Latin motto meaning “In heaven there is rest.” The annunciation scene in the window contrasts directly to Mariana’s unfulfillment, while the bed and burning candle suggest physical desire. These details show how innovatively Millais uses objects; while fellow Pre-Raphaelite Rossetti preferred one-to-one symbolism, à la “dove = Christ”, Millais has a more well-rounded approach, allowing objects to have their own natural presence while still evoking Mariana’s psychological state. The Pre-Raphaelite brotherhood had been formed by English artists Millais, Rossetti and William Holman Hunt in 1848 as a reaction against what they considered the frivolity and staleness of the Academy, where they were students. They turned to the art of the past, from before Academy fave Raphael came along and ruined everything, for inspiration. There they found the attention to realism, as well as a certain sense of probity, that appealed to them. The rebels favored rich jewel tones, finely wrought details, faithfulness to nature, and serious, literary subjects, all of which are on display in Mariana. Shakespeare’s maidens were a common choice for the PRB, Millais’ most famous work probably being his painting of Ophelia, but his addition here of Romantic poetry was rather a novelty. In fact, in 1850 when Tennyson heard that Millais had done a painting of a poem by Coventry Patmore, he is noted to have wished aloud that Millais would paint one of his own poems. Little did he know, Mariana was already in the works. This work was purchased by dealer Henry Farmer, who had also bought Christ in the House of his Parents, and he in turn sold it to one Benjamin Godfrey Windus, a retired coach builder and purveyor of “Godfrey’s Cordial,” a popular children’s throat medicine. He was a prominent collector of the Pre-Raphaelites and Turner, clearly possessing an eye for the most groundbreaking British art of his century. Fowler, Frances. “‘Mariana,’ Sir John Everett Millais, 1851 | Tate” last modified December 2000. http://www.tate.org.uk/art/artworks/millais-mariana-t07553. Hilton, Timothy. The Pre-Raphaelites. New York: Harry N. Abrams, 1970. Marsh, Jan. Pre-Raphaelite Women: Images of Femininity. New York: Harmony Books, 1987. Rosenfeld, Jason. John Everett Millais. London: Phaidon Press, 2012. Smith, Alison. Reflections: Van Eyck and the Pre-Raphaelites. London: The National Gallery, 2017. Treuherz, Julian. Victorian Painting. London: Thames & Hudson, 1993. Alfred, Lord Tennyson. "Mariana." Poetry Foundation. https://www.poetryfoundation.org/poems/45365/mariana. Accessed March 20, 2019. Mariana is an 1851 oil-on-wood painting by John Everett Millais. The image is based on the solitary Mariana from William Shakespeare's Measure for Measure, written between 1601 and 1606. In the play, Mariana was to be married, but was rejected when her dowry was lost in a shipwreck. Her story was retold in "Mariana", a poem published in 1830 by Tennyson, which provided additional inspiration for Millais' painting. The painting is regarded as an example of Millais' "precision, attention to detail, and stellar ability as a colorist". Millais was a founding member of the Pre-Raphaelite Brotherhood, a group of English artists who came together in 1848 with the goal of renewing British painting. They found in the art of the early Italian Renaissance—before Raphael—a sincerity of purpose and clarity of form that they sought to emulate. Oftentimes the PRB artists used allegorical images to create a narrative, which taught a moral virtue or virtues. Sometimes they used contemporary literature as inspiration for their paintings, which often include numerous details that allow the viewer to "read" the painting. Millais used Tennyson's poetry to create a narrative for his painting of Mariana and he wanted to allow the viewer familiar with Tennyson's poetry to read the entire poem through the painting. The painting is packed with details that help the viewer to read the narrative of the work along with Tennyson's poetry. Everything from the rolled embroidery that Mariana has been working on and the leaves outside of the window point the reader in the direction of the narrative which is about a young woman rejected by her fiancé because her dowry was lost at sea. It is about waiting and the passage of time, which Millais shows by the arched-back pose of the woman. The pose makes it seem like she has been sitting too long and she must stand up to stretch before she sits again. The rolled embroidery on the table gives the viewer a clue as to how long Mariana has been working on it. In the painting Mariana, Millais included many details that relate directly to Tennyson's poetry. One example is the curtain. In the poem, Tennyson wrote, "When thickest dark did trance the sky, She drew her casement-curtain by, and glanced athwart the glooming flats". Although there is not a curtain in Millais' painting, this line is similar to the scene that is presented outside of the window. The viewer perceives an ominous feeling, just like the dark storm that Tennyson alludes to in the line above. The little mouse that is on the floor towards the bottom right corner is a detail that Millais took from Tennyson's poem: "the mouse behind the mouldering wainscots shriek'd or from the crevice peer'd about". Together, Millais' painting and Tennyson's poem create an intriguing storyline for the reader to follow. Check out the full Wikipedia article about Mariana (Millais).